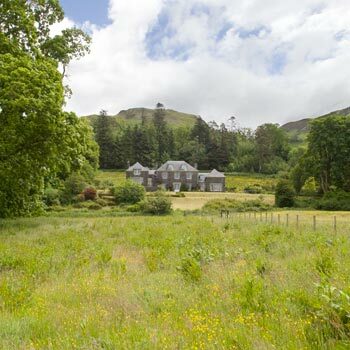 Glenmore is set under a backdrop of heather-covered hills on a grassy terrace overlooking meadows which stretch away to the shores of Loch Melfort. The air is clear, you can smell the scent of the Atlantic, the light changes quickly as clouds form and unform hiding and revealing the blue and flashes of sun. 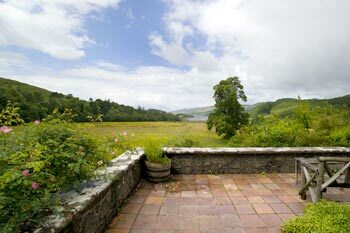 The terrace and view across meadows to Loch Melfort. This area of Argyll has been inhabited since the Mesolithic period, and there is an extraordinary abundance of rock carving, standing stones, cairns and henges from around 5000 years ago in the area. Together with the gentle beauty of the landscape, it is no wonder many call this place magical. Melissa and Alasdair Oatts welcome guests to this their friendly, informal and relaxed home which has been in Alastair's family since the 1850s. A new wing was added in the 1930's and a fascinating carved oak staircase. There is mellow old pine woodwork, an unusual decorative plaster cornice, pictures and antique furniture. 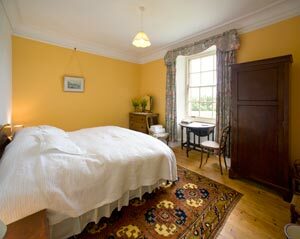 The two guest bedrooms that Alasdair and Melissa have set aside for their bed and breakfast guests look out over this wide panorama, one in the "New Wing" the other, the Yellow Room, in the older part of the house which dates from the middle of the 1800s. The New Wing Suite bedroom is large with two windows one with views to Loch Melfort, the other over the front entrance to trees and hills. It has twin beds (or one enormous double bed). Also in the suite is a hall with a sofa, an extra single bedroom ideal for a child, and a bathroom (bath, shower over, basin and wc). 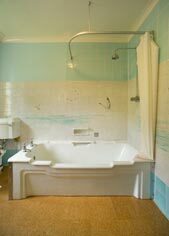 The New Wing was built in 1935 and has a nice Art Deco feel about it: the beds, fireplace, light-fittings and especially the bath. 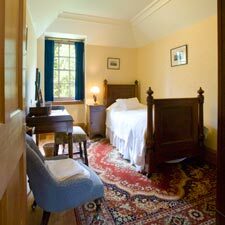 The bedrooms have a hairdryer and tea and coffee making tray. An additional bed or cot/crib is available by arrangement. Below; Double bed, the view from the window to Loch Melfort, and private bathroom (bath, shower over, basin and wc) a couple steps away. Right; Breakfast is served in an alcove in the Drawing Room. 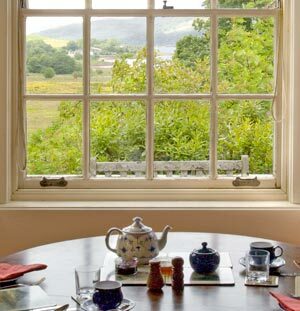 A cooked traditional Scottish breakfast or a continental-style breakfast is available as you wish. Packed lunches can be prepared for guests on request, with notice. Up and down the coast there is a good choice of places to eat out in the evening, or there's fish and chips in Oban. "Wonderful and peaceful homely place". Boyd, Hants. "Excellent, friendly, best nights sleep we've had in years". Edgar, London. "Nice place, Merci pour l'accueil". Cavellini, Switzerland. 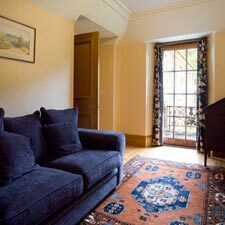 £42.50 to £45.00 per person per night, based on two people sharing the double/twin room and half price for children using the single room and sofabed. 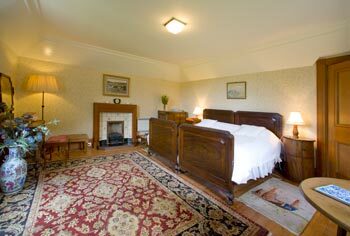 £37.50 to £40 per person per night, based on two people sharing. Exact rates depend on length of stay and time of year. 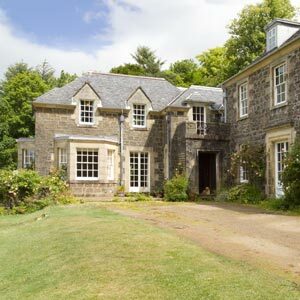 Please see Melissa and Alasdair's website for availability, exact prices and booking. No pets in the house please, and no smoking please. 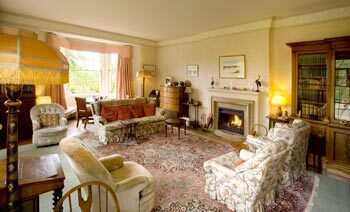 You are welcome to relax in the downstairs Drawing Room. Left; Sorcha, the very friendly family dog. Please tell Melissa and Alasdair you found Glenmore through About Scotland!